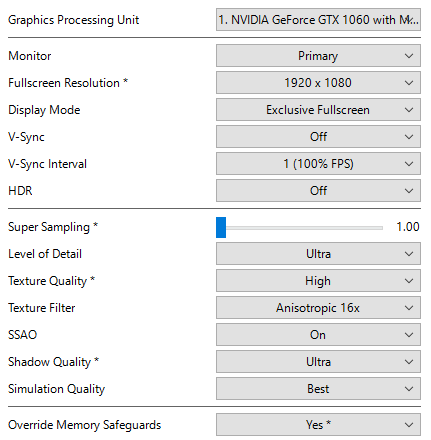 The following analysis and assessment was made using GeForce driver v416.81 and Intel UHD Graphics driver v23.20.16.4973. It should also be noted, as stated above, the following analysis and assessment was made using the pre-release version of Hitman 2 made available to those who purchased the game's Gold Edition. The graphics settings have been simplified compared to Hitman. Gone is the ability to select the quality of shadow maps, whether to use anti-aliasing, and the ability to use DirectX 12 over DirectX 11. Whether this game will have DirectX 12 support added later remains to be seen. Also, while the in-game graphics options are identical to those the game's launcher provides, the game does feature real-time switching of graphics options in-game. This means you can immediately see the effects on quality and performance based on your choices without confirmation - as happens in so many games both new and old. The following takes apart each of the game's individual graphics settings, shows how they work in-game and affect the image, as well as how they perform on average. The performance figures shown are based on the results of testing via the game's built-in benchmarking mode. It should be noted the FPS amounts shown here will look differently than most PC Reports as Hitman 2's benchmarking mode is non-deterministic. This means what the benchmark does, unlike most benchmarks, is pan a camera through a specific scene and lets the game's AI, physics, and other systems run as if a player were actually playing the game. Every benchmark session is unique - and, as a result, each finished session will have different FPS amount. I should also note with all settings at their lowest levels, there seems to be some kind of frame rate limiting going on, as the average FPS always hovers around 60 FPS - even with v-sync disabled. As you can see, the performance goes from over 60FPS to just over 50FPS when switching from the baseline to maximum settings without Super Sampling Anti-Aliasing. With Super Anti-Aliasing turned on, the performance tanks to less than 20FPS on maximum settings. How all this comes together will be explained in the upcoming sections. Super Sampling Anti-Aliasing (SSAA), or Super Sampling as it's referred to in the graphics settings, has the GPU generate the game's graphics at a resolution higher than the actual resolution of your monitor, then reduces the resolution back down to your monitor's actual resolution. The result is a cleaner, more detailed image the larger the GPU generates the game's graphics. You can specify the amount of Super Sampling as a percentage of your monitor's actual resolution in 10% (0.1) increments from 1.0 (off) to 2.0 (max). This means at maximum Super Sampling, on a 1920x1080 (Full HD) display, the actual graphics resolution is increased to 3840x2160 (Quad HD). Even with the settings cranked down as low as they can go, Super Sampling quickly eats up ~20FPS at 150% (1.5) resolution, while 200% (2.0) Super Sampling utterly tanks performance to ~25FPS - an almost-unplayable framerate. However, keep in mind this dramatic loss of performance would be roughly the same if I played the game in 4K without Super Sampling; when enabled, Super Sampling is literally generating higher-resolution graphics and fitting them to however large your display is. This is exactly what the game describes it in-game: LOD determines the detail of objects, as well as how close an object has to be to become detailed. While the benefits of a higher LOD may seem to diminish the further away objects are from you, take a closer look at the yellow-colored room on the second floor of the building. In low LOD, it appears empty; in ultra LOD, the room appears fully-furnished, with the finer details just out of sight. Here, the difference between LOD levels seems even less than the outdoor version due to how the game handles crowds. That said, take a look at the white tent near the center of the image. At low LOD, the tent seems like it's blurring into the crowd; whereas on high LOD, the tent is clearly detailed, even amongst the hoards of people in front of it. Surprisingly, the game's LOD system is able to keep a high framerate even at Ultra settings, though slightly lower than the baseline FPS. So if you want to keep to a more sold 60 FPS, stick with high or, if you're willing to take the quality hit, medium. Ultra certainly remains an option - but do keep in mind you'll need a GPU roughly as powerful as the recommended GPU (like my GeForce GTX 1060) if you want it to be playable. Most of the game's graphics are very high-quality, even with Texture Quality set to Low. That said, the game does reduce the quality of lower-importance textures, like the banner in the center of the images, when texture quality is lowered. Because most of the game's textures are high-quality regardless of how Texture Quality is set, FPS is consistent across the three possible settings. Unless your GPU has less than 4GB of memory, you should be able to set Texture Quality to High and have no issues. This controls how textures, especially those at a sharp angle to the player camera, are filtered so they can remain sharp. The game offers trilinear filtering as well as the usual array of anisotropic filtering levels (2x, 4x, 8x, and 16x). Normally, the game's textures aren't nearly as noticeable as this sign at an angle; hence why I singled out this particular example. However, as you can see, anisotropic filtering is essentially costless in terms of FPS. As such, setting Texture Filter to Anisotropic x16 is essential and won't cost you FPS - even if you only meet the minimum specifications. SSAO is a venerable, if controversial, method of adding additional depth to an image by simulating more precisely how light is blocked by physical objects. The effect is serviceable and, in the eyes of this reviewer, inoffensive. It adds additional depth to the image, though it has the typical issue of objects, such as the railings in the above image, appearing closer to other objects than they seem because SSAO is based on what the player can see (screen space), not on the true physical relationship between objects. The implementation of SSAO in this game is very efficient, meaning if you like it, you're not losing any meaningful amounts of FPS. The final graphical option controls the resolution of shadows of both static and dynamic (i.e. toggleable and/or moving lights). The only thing to note is High Shadow Quality is near-identical to Ultra Shadow Quality. There is some detail lost, but it's so minimal that you may want to stick to the High setting. That said, the FPS loss is negligible either way, so unless you have a card which meets the minimum specifications, Ultra shadows are handily-achievable. The game's keyboard and mouse options are few aside from keybindings. There are only two options you can adjust: inverting the Y axis and adjusting how sensitive the mouse is in-game. You'll actually want to keep the sensitivity as low as you can, about 0.75 in my experience. While higher sensitivity levels are useful - especially for sniper-only missions - it tends to get in the way of such simple things as aiming throws and more standard guns like pistols and regular assault rifles. As for the keybindings, everything aside from what keys or mouse movements move the camera can be changed. I can't test controller support as I own neither an Xbox One controller nor a DualShock 4 controller. However, if you did own one, there is no in-game way to actually change the action mappings on a controller in-game. Nonetheless, controllers are customizable to some degree. You can invert both the X and Y axis, adjust aim and camera sensitivity, and toggle aim assist options. Also, for those who use a Steam Controller, sadly, Hitman 2 lacks native support for it. Audio support is quite complete in Hitman 2. You can adjust the game volume as a whole as well as adjust the individual volumes of effects, dialogue, and music. You can even configure the game to use up to 7.0 surround sound! The real treat lies in the game's language (subtitle) settings. Not only can you adjust what language the GUI and the in-game subtitles are in, but you can also adjust how large the subtitles are. This is extremely handy for the hard-of-seeing (legally-blind) and for players using a TV monitor for gameplay. While it is disappointing to see such simplified options in Hitman 2, I cannot deny the game, even on Ultra settings, just works at ~60FPS, and it just looks gorgeous, even on minimum specifications. If you're looking for a good Hitman 2 port for the PC, this is it. Special thanks to PCGamingWiki contributor Aemony, who graciously co-authored the game's wiki article as well as captured the various settings screens in and out of game! PC Reports are a series of quick first impressions regarding the technical aspects of a PC game. This report was written by PCGamingWiki contributor Expack3. For an up to date account of Hitman 2 fixes and improvements, please visit its respective PCGamingWiki article.